Scientists from the United States and Russia looked into the peculiar change of phase in a quantum material exposed to the laser pulse. The results of this study perceived as a significant advancement in optoelectronics were published in the prestigious scientific journal Nature Physics. If you take a piece of ice in your hand, it will melt, i.e. go from the solid phase into the liquid one. Nature offers countless other examples of phase transitions triggered by a change in temperature. However, exposure to colder or warmer environment is not the only reason for phase transition that can also occur under the influence of the laser which is capable of changing the temperature very quickly. In the paper published on 15 October, an international group of scientists, including researchers from the Massachusetts Institute of Technology (MIT) and Skoltech, looked into the effects of the laser pulse capable of causing a phase transition in a quantum material where electrons spontaneously form a charge density wave. The paper reported evidence that the laser pulse generates long-lived microscopic objects termed topological defects, that should be taken into account when designing new optoelectronic devices based on this class of materials. A team of MIT researchers led by Professor Nuh Gedik conducted a series of staggeringly complex experiments to capture a material’s state at very short time intervals using state-of-the-art equipment: a change in the material subjected to the laser pulse was registered with time resolution of less than one-trillionth of a second! A group of theoretical physicists from Skoltech led by Professor Boris Fine gave a helping hand to their American colleagues in interpreting their findings and spotting the topological defects. 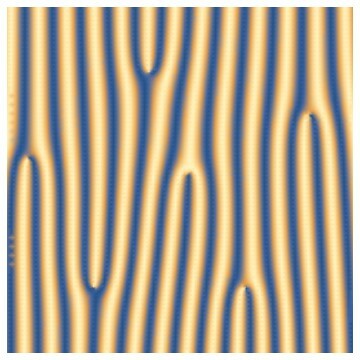 The topological phases in quantum materials are a hot topic for physicists, mathematicians and chemists alike. It was for the discovery of topological phases and topological phase transitions that David Thouless, Michael Kosterlitz and Duncan Haldane were awarded the Nobel Prize in Physics in 2016. The research on the role of topological defects in phase transitions was initiated by Soviet theoretical physicist Vadim Berezinskii in the early seventies. “Collaboration with Skoltech was key to figure out a physical picture that is consistent with all of the experimental data,” noted Gedik. The Russian researchers concurred with Gedis’s sentiment. “Collaboration with our colleagues from MIT was an invaluable experience for me,” said Skoltech PhD student Pavel Dolgirev. “Their relentless questions prompted by the experiment pushed us to give second thought to every aspect of our theoretical understanding,” ‒ added Dr. Alexander Rozhkov, Senior Research Scientist at Skoltech. This joint study became possible thanks to the Next Generation Program (NGP) aiming to support the collaboration between Skoltech and MIT.